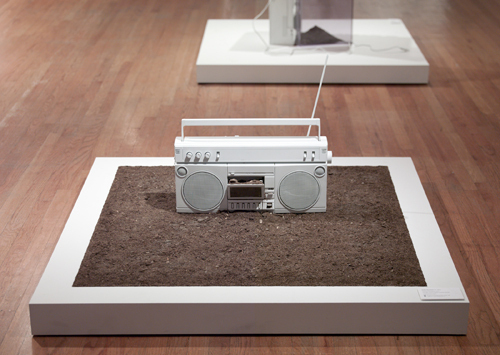 Sadie Barnette, Untitled (Boom Box), 2012, vintage cassette player, enamel, dirt, 32 x 32 x 10". Featuring work by twenty-nine different artists—many of them represented through multiple contributions—“Fore” continues in the vein of the Studio Museum’s previous group shows (the alliterative “Freestyle,” 2001, “Frequency,” 2005–2006, and “Flow,” 2008). The exhibitions have helped introduce emerging talent in a number of different media, from painting to site specific installation. To be sure, many of the artists in “Fore” have already staked out notable places in the contemporary scene. Noah Davis contributes with Found Photo, 2012, a characteristically arresting portrait of a foregrounded young man in three-quarter profile, set against a window frame and an abstract section recalling a vagrant Clyfford Still painting. Equally striking is Jennifer Packer’s group of canvases, painted in a loose, unceremonious hand—a hand fittingly wed to their imagery of lounging and loafing. Letting the oil paint occasionally pool and coagulate on the surface of the works, Packer underscores their unhurried informality. Firelei Báez’s gouache drawings on paper are, by contrast, meticulously rendered. Made up of floral, decorative patterns and set onto the empty spaces of found, yellowing book pages, Báez’s lone bodies draw upon popular imagery, Caribbean history, and the work of Francisco de Goya. Hung at a slight distance from the wall, the paintings demonstrate a playful vitality and elliptical, literary imagery that bring the pages alive, as if drawing out a faded narrative strand sunk into the weft of yellowed paper. Painting is by no means the only mode here. Sadie Barnette’s deadpan objects/installations—like Untitled (Boombox), 2012, with its eponymous appliance painted white, its cassette port improbably stuffed with dirt—are striking in their quiet incongruity. The semiotics of color (or its lack) perhaps conjures up a parallel discourse here, particularly given the upshot of a made-over “ghetto blaster.” Yet the works also evince an unadorned lyricism, free of any heavy-handed conceit. Video finds poignant treatment and humorous nuance in Steffani Jemison’s Maniac Chase, 2008–2009, and Nicole Miller’s two-channel Daggering, 2012, which juxtaposes footage of the artist dancing ballet with footage of Caribbean dance-hall “daggering” (a bawdy and raucous dance craze). Propriety and defiant indecorum tangle here in an extended pas de deux that conjures up the tensions of female young adulthood. Other highlights include the splintered signage of Brenna Youngblood’s Untitled, 2012, and Toyin Odutola’s pen-and-ink portraits, with their looming visages and literary allusions.